Wash and dry the mangoes. See that there is no trace of water on the mangoes. Similarly wash and dry the knife and chopping board. Peel the mangoes and cut them into even sized pieces removing the pith. Take a broad vessel and add the raw mango pieces. Now add the turmeric powder and salt to the mango pieces and mix them well. The salt when comes in contact with the sour mangoes releases water (OOTA in TELUGU). Take a ceramic bowl or glass bowl and add the mixed mango pieces along with the water oozed. Cover the bowl and keep it aside in a dry place for 2 full days. On the third day press and remove water from the mango pieces. Separate the juice and pieces from the mango mixture. Spread a plastic sheet in an open place under sun and spread the mango pieces on it. Let them dry in sun for one full day. Similarly keep the juice jar, covered, also in sun for 2 to 3 hours. In summer seasons the sun will be hot and bright. So drying the mango pieces for one full day in bright and hot sun will be sufficient. When dried, bring back the mango pieces to prepare the pickle. Take oil in a bowl and heat it till it reaches the boil. Keep this bowl aside to cool the oil. Let the oil cool completely. Heat a pan and add the fenugreek seeds. Fry the seeds on low heat stirring all the while to get even browning. 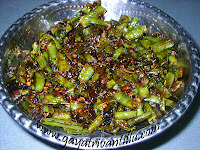 To test the doneness of frying the fenugreek seeds do as follows. Take a fried seed and crush it with a stone or any heavy thing. The seed should be evenly browned from inside. The crushed seed should appear brown from inside and outside. Then stop frying the seeds and let them cool a bit. Take a dry mixie jar and add the fried fenugreek seeds and powder them finely. In the juice of mangoes add the sun dried mango pieces, fenugreek seeds powder and red chili powder. Mix all well with a dry spoon. Now add the oil which has been heated and then cooled, to the pickle little by little. Add oil till you get the right texture. Now the pickle is ready for seasoning. Heat a pan and add oil to it. Break red chilies into 2 pieces each and keep them aside. When oil is hot add the fenugreek seeds and mustard seeds. Fry the seeds till they splutter. Add the asafoetida and mix well. There will be a nice aroma of asafoetida filling the space. Add the red chili pieces and before they turn black remove from heat. Add this seasoning to the prepared pickle and mix well. Keep it aside for a while to cool. Store this pickle in a glass or ceramic jar. See that all the ingredients and things used to prepare the pickle are totally dry. Any trace of moisture will spoil the pickle soon. Use salt depending upon the sourness of the mangoes. Do not add entire salt at once but add little by little. Fry the fenugreek seeds on low heat stirring all the while for even browning. When you fry on high flame they will turn brown fast but they will be raw from inside. So test the fried seeds by breaking a seed and observing the even browning of the seed from both inside and outside. Heat the oil used in this recipe till it reaches the boil. Now cool the oil completely. When oil is added to the pickle without cooling, it absorbs more oil and within a short period the pickle smells oily. It is advisable to cover the vessel immediately for few seconds, after adding the seasoning to retain and absorb the nice aroma of the seasoning. Always store the pickles in a ceramic or glass vessel only. The sourness of the mangoes corrodes metal vessels. Remember that the mangoes which are not fully matured are not to be pickled on large scales. A fully matured mango will have the stone or seed (TENKA IN TELUGU) which is hard. 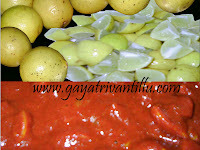 Till you get such mangoes enjoy this temporarily prepared MUKKALA PACHHADI. Eat this pickle mixed with rice and ghee. This pickle also can be served as a side dish while serving dal. This pickle goes well with curd rice also. In summer season tasting this pickle with curd rice will be delicious.